During the 17th century the Netherlands were taken over by what is called "Tulip mania." 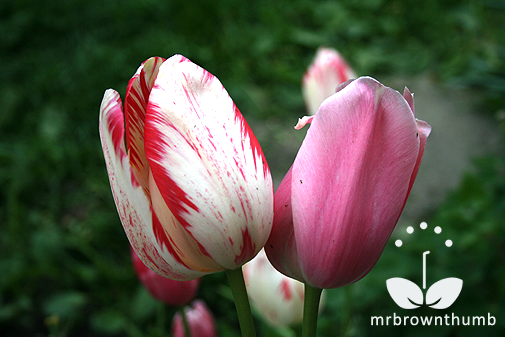 Shortly after being introduced tulips became a symbol of status and a way to showcase wealth publicly. Semper Augustus, with its red and white streaked petals, is famously remembered as being the most expensive tulip sold during the "Tulip mania." At the time it wasn't known that the spectacular colors in the petals of tulips were caused by a tulip virus. Tulip breaking virus was carried by the green peach aphid and while the virus caused beautiful flowers, it also caused weak bulbs that died slowly. Anna Pavord, author of Bulb, tells us of similar speculative bubble happening in England with snowdrops today. Not quite to the extent of "Tulip mania" but it is interesting to see that we're all more than happy to repeat the mistakes of the past. 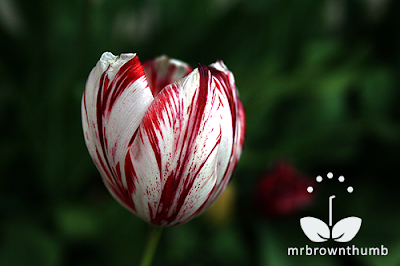 Not Semper Augustus but a tulip in my own garden with red and white streaks. Going out into the garden to survey the three blooms of this tulip (NOID) helps me to understand how something like 'Tulip mania' could've occurred, the blooms are beautiful. Earlier this spring as the bulbs were emerging in the garden from the window I noticed that something was different with the tulip bulbs in my garden. From a distance I could see that the leaves emerging from some of the tulip bulbs were stunted and contorted. Here is a photo of a tulip bulb leaf showing signs of a virus next to a healthy tulip leaf from a bulb growing right next to it. We've had a pretty dry spring this year and for a moment thought that perhaps the leaves were growing in this weird fashion because the bulbs had been dry as they were breaking dormancy. The plants in my garden have to survive on mostly rain water because I use as little water as possible to maintain them. Not exactly a rain garden but plants that aren't very tolerant of drought find themselves quickly ignored and die. The tulips have done surprisingly well the past couple of years that I've instituted the restrictive watering practice. The second clue that what my garden bulbs were experiencing wasn't normal was the streaks in the leaves. 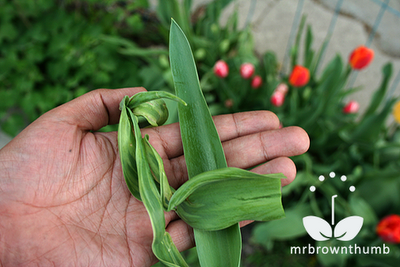 The photo above shows a streaked tulip leaf next to a healthy tulip leaf growing in the same clump of tulips. Here is a photo of the clump of tulips in my garden showing some normal tulips and some diseased tulips growing next to each other. Can you see the difference in the leaves? On the right in this picture is a pink tulip that looks the same as they have in recent years. On the left is a bloom from one of the infected tulips, it used to look like the tulip on the right. The changed blooms is the final clue, the weird growing habits and leaves aren't related to the garden being kept dry to conserve water. This clump of tulips in my garden is infected with some kind of virus. ‘Breaks’ (streaks of a different colour) in the flowers (TBV). 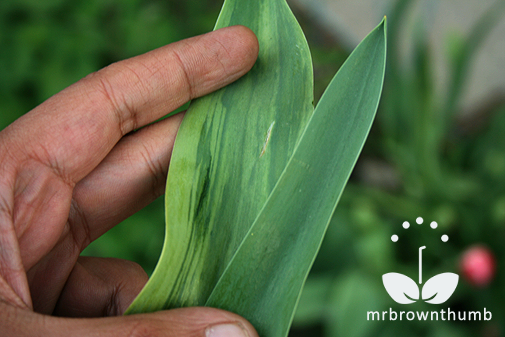 Brown, dead streaks appear in the leaves and stems (TNV). 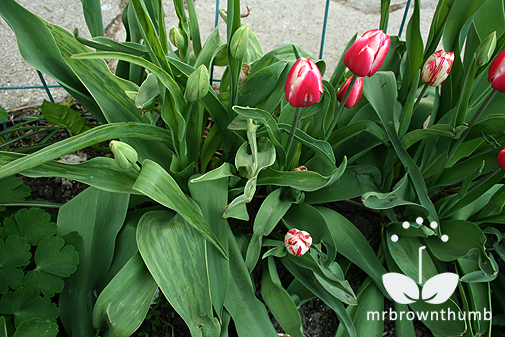 Sunken brown spots, arcs or rings in the bulbs, such bulbs give rise to stunted and distorted plants (CMV). Plants may be stunted, but not otherwise unaffected (ArMV, LSV). While searching Google for Gardeners for clues as to what was affecting the tulip bulbs I came across this list of tulip viruses on the RHS website. Vectors for these viruses include aphids and nematodes that that live in the soil and some are vectored by other insects or transmitted on prunning tools. There is no cure for tulips that have viruses and once found infected tulips should be destroyed to prevent spreading. Purchasing tulips from reputable sources, both mailorder and retail, will help lessen the chances that you buy infected bulbs. When I purchased my bulbs they were healthy, free of blemishes and the skins were intact. This leads me to believe that the vector in the case of my tulips was one that was inhabiting the soil. My only option here is to remove and destroy this clump of tulips and start over and attempt to do something about any possible nematodes inhabiting the garden before this spreads to other bulbs, mainly my black tulips "Queen of Night" and "Black Parrot". I just got in the house from my usual round in my garden and read your post. It is very informative. I am planning to dig my 'Shirley' tulips because I found a couple of my lilies with mottled and distorted leaves. Lilies and tulips can't be planted together. Thanks for all of the infos. I have had this happen also. Luckily, with tulips, most species are not long lived. Although, my Emperor tulips consistently come back but not quite as large. Never any luck with tulips - our winters are too warm. But yours are lovely and make me want to try again. Forget tulip mania, I have tulip envy. For years I blamed the groundhog, but haven't seen him/her/them this season... and yet my tulips were eaten. Maybe it's rabbits. Or hungry aliens with impeccable taste. I dunno. In any case, I love the infected tulip; it's so cool how it gets red and white from pink (usually the other way round), and the contorted leaves appeal to me too. I bought a house last fall that had was pretty well landscaped by previous owner, I have been waiting to see what will be coming out. I am familiar with tulips because we had them at our house growing up and knew they would be one of the first to bloom. But after waiting for weeks only one red tulip actually came out of a big bunch that was in our front yard and the wind soon wisped that away so that now I am left with nothing but leaves and no sign of other tulips. After reading your post I am going to inspect a little closer and look for any signs of this virus. Thank you for this info. That's interesting about planting lilies and tulips together. I wonder if me planting my tiger lilies so close to my tulips had anything to do with it. Did you do anything special to combat it? I can't imagine living somewhere that is too warm for tulips. I read an article recently about someone in southern California who refrigerates tulips and causes a sensation in some city down there when they bloom. Crazy! But I can understand people's desire to see tulips blooming in warm locations. Funny that you mention that because I was just thinking of planting some in a wire "cage" I found, not to keep rabbits from eating them but to make it easier to lift the bulbs if I ever wanted a change. It could also be that the previous owner planted tulips that just pooped out. Some like my black tulips only last a few years before they stop blooming and you have to buy more. I hope your other tulips won't be affected. There seem to be a lot of weird plant viruses in the last few years. Many of those new coneflower cultivars seem to be very disease-prone. I have a client whose roses are all infected with rose mosaic disease. I think they came from the nursery infected, since she told me they had been planted the year before I started taking care of her garden, and I noticed the telltale signs the first year I was there. I gave up on tulips here - not enough sun, and the rabbits devour them. The ones I planted several years ago at my last house are blooming now though, and I enjoy driving past there every so often - the new owners have kept the front gardens exactly as I left them. I'm curious about what might be going on in the backyard - there were a lot of tulips back there too. That's interesting about the new coneflower cultivars. I'm now kind of glad that I gave up the desire to own so many of them a couple of years back and keep wanting to move more of the out of the garden to make room for something else. Wow, great post. I've got two ancient flowers that bloomed red starting the first year we were here, 1986, (meaning they were already at least a year old, because I didn't put them in!) They have kept on blooming but started coming up streaked red and yellow about 8 years ago. They're still doing it, and I love these flowers. I'll be sad when they finally decide that 30 years is a plenty long life for a tulip! Congrats on your Mouse and Trowel! Hope you get a trowel and not a mouse!! hi i am new here, i am from the tropics and tulips cannot survive here. But i think we import some cutflowers as i see some in expensive flower stores. I already know of the tulip virus from Phil's Digital Botanic Garden from UK. So do you burn them when you see the symptoms of viruses, do they affect other plants? I seems difficult to discard as they look so beautiful even with the viruses. That's awesome that you've had tulips blooming for that long. Hope they never figure out how long it has been. I don't really like daff, but some pistachio green ones may change my mind about them. They sound lovely. Thanks! I hope I don't get a mouse either. I'm going to have to burn mine. They only affect other bulbs. I can see why Semper Augustus was all the craze. Your infected tulip is truly gorgeous. Simply stunning! Even with excellent professional hybridization breeding and methods in modern times, I personally feel that it is very difficult to match the unique beauty of these tulips infected with a virus. Too bad!